Add this winter front/bug screen to your '10-'18 Ram Cummins Heavy Duty truck and have the best of both worlds. When it's rolled down, it serves as a winter front. When it is rolled up for warmer weather it acts as a bug screen to help keep the radiator clean for cooling. 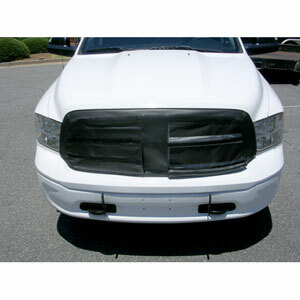 It installs outside the engine compartment and fits over the truck's grill. Fasten and unfasten the velcro to roll and unroll it. "Your selection and prices are great. Even more important to me though is your customer service, everyone I've ever spoken with has been very friendly and knowledgeable. Customer service is most important to me, and y'all are top notch!"